This week has been one of those, slightly disorienting weeks, that seems to last forever and left me eternally uncertain of which day we were on. But, as I've had no work or classes, it's been really refreshing to just mosey through the week at my own pace and catch up on some rest. 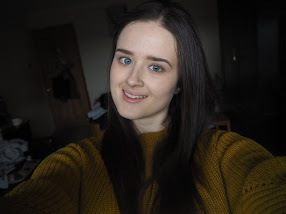 Alongside all the rest, I've actually had a pretty productive week of getting on with university work and (eek) filming my first ever youtube video. So here are some of the things that made me smile this week. Easter break. This week has been the first week of my Easter break from work and university and I've been loving the chance for a good rest. We've been having a lot of, what I call, productive weather days aka, rainy days which I've been taking advantage of to finally make some progress on my dissertation. But, when I've not been sat in my dressing gown, chipping away at my workload, I've just been taking advantage of the opportunity to relax before my last few weeks at uni, ever. Chocolate. Partly because it's just been Easter and partly because dissertation writing requires a lot of snacks, I've been enjoying plenty of chocolate this week. And, after eating my body weight in chocolate, I can definitely say that the Moo Free Chocolate Orange Egg is the tastiest vegan chocolate (but, be warned, it is addictive)! Hot cross buns. Another welcome side effect of Easter is the abundance of hot cross buns everywhere and I've been taking full advantage by eating them all week. Aside from the homemade buns I made a couple of weeks ago, the tastiest vegan friendly hot cross buns I've found have been the Kentish Apple Hot Cross Buns from M&S which taste really bloomin' amazing with some almond butter, raspberry jam and a cuppa. Meeting lambs. After raving about seeing some lambs last week, Jay and I decided to head out on a bike ride this Thursday to see if we could find any more and, just as we were about to head home, we bumped into a farmer who invited us into the barn to meet his lambs. I literally couldn't believe our luck and it was such an amazing experience to get up close with some adorable little lambs. Sunny days. The weather this week has been pretty grey and rainy most days and we even got a little snow on Monday! Normally, I'd be a little disappointed to have such bad weather on my week off but, as the rain has been helping my positivity, there's been no complaints from me. But, after a good few days of grey, I was definitely happy to see some blue skies on Thursday morning. We took advantage of the warmer, brighter weather and enjoyed a long bike ride which was exactly the kind of study break I needed. Zizzis. Usually, when it comes to pizza, I'm a 'eat a take-out in your pjs on the sofa' kind of gal, so I don't really go to restaurants all that often but, when I do, it's usually a Zizzis because their vegan cheese is ridiculously delicious. As it was Jay's dad's birthday this week, I got my Zizzis fix and, as always, the vegan cheese pizza was just as good as I remembered! Pastel highlighters. I've always been something of a stationery nerd and my addiction to wasting money on endless amounts of pens, post its and notebooks has only intensified since starting my bullet journal last summer. My bullet journal definitely isn't the most artistic but, when I spotted a packet of pastel highlighters this week, I told myself that I absolutely needed them for my bullet journal and bought them immediately. They are super pretty though so there's no regrets here!